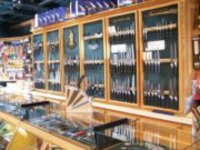 American Flags & Cutlery specializes in knives, flags, and kitchen utensils. They sell high quality kitchen, sporting, hunting, and pocket knives. U.S. made very high quality American, California and military flags can be found in the flag section of the store. Poles and other flag accessories are available as well.